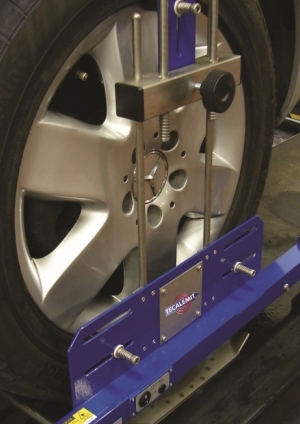 Wheel alignment, usually referred to as tracking, is part of standard car maintenance that consists of adjusting the angle of the wheels so that they are within the car manufacturers specification. The purpose of this adjustments is to reduce tyre wear, and to ensure that your car travels straight and true (without "pulling" to one side).All new vehicles leave the factory with their alignment checked and adjusted but it is advisable to check after about 3000 miles once the suspension has settled which can lead to vehicle pulling and uneven early tyre wear. This tyre wear leads to frequent replacement of tyres thus adding to a cars running cost. Initially you may not notice these defects but after driving some time or distance it can cause uneven tyre wear and a pull/drifting to the left or right. Vehicle pulling can cause irritation and/or fatigue while driving the car. Under normal driving conditions many vehicles can go around 30000 miles before they need a new set of tyres, which is a good interval to have the alignment checked as well. Any severe driving incidents (i.e. "kerbing" the tyre), or replaced suspension components would also warrant a check. The typical process of alignment on a standard car takes about an hour under ideal circumstances.